Eggplant Parmesan is an Italian casserole meal consisting of eggplant, cheese and tomato sauce. 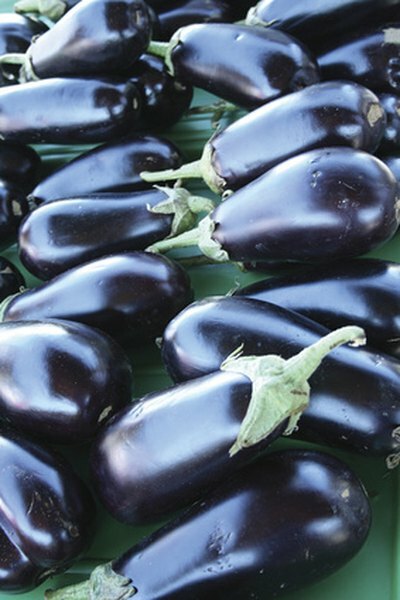 While eggplant by itself is a healthy food to include in your diet, in this Italian classic, the eggplant is usually fried in oil, increasing its fat and calorie content. But if you know the nutrition information for eggplant Parmesan, you can adjust your diet to fit it in a serving every once in awhile. There are a number of eggplant Parmesan recipes and ingredients may vary, changing the nutrient information. A classic recipe includes eggplants, eggs, Italian seasoned breadcrumbs, spaghetti sauce, mozzarella cheese, grated Parmesan cheese and dried basil. The following nutrition information is based on the ingredients from this recipe. The homemade eggplant Parmesan recipe makes 10 servings. Each serving contains 487 calories. The U.S. Department of Agriculture recommends that you limit your total fat intake to 20 to 35 percent of total calories, and limit your saturated fat intake to less than 10 percent of total calories. A high intake of saturated fat increases your blood cholesterol levels and your risk for heart disease. In a 2,000-calorie diet, you should limit your total saturated fat intake to less than 22 grams per day. One serving of homemade eggplant Parmesan contains 16 grams of total fat, of which 7 grams are saturated. Carbohydrates should make up the majority of your calorie intake, or about 45 to 65 percent of your daily calorie needs, according to the McKinley Health Center. Carbohydrates provide your body with energy. Dietary fiber is a type of carbohydrate that offers a number of health benefits, including lowering your blood cholesterol levels and controlling your appetite. Most women need 25 grams fiber per day. One serving of homemade eggplant Parmesan contains 62 grams of carbohydrates and 9 grams fiber. If you use whole-wheat bread crumbs, the fiber content will increase slightly. One serving of homemade eggplant Parmesan contains 24 grams protein. Healthy adult women need 46 grams of protein per day, which means that a serving of the eggplant dish supplies just over half of that goal. High intake of sodium causes your body to retain fluids and increases your blood pressure. The USDA recommends you eat no more than 2,300 milligrams of sodium a day. One serving of eggplant Parmesan contains 1,663 milligrams of sodium, meeting more than 70 percent of your daily sodium needs. Use low-sodium spaghetti sauce and reduced-sodium cheese to cut this amount and make the dish a bit healthier.